Roger A. Wach, age 68, of Park Ave. Waubeka, WI died Friday October 4, 2013 at Heritage Health and Rehabilitation Center, Port Washington with his family at his side after his ongoing battle with cancer. He was born on June 25, 1945, son of Aloysius and Armina Bonlender Wach in West Bend, WI. He grew up in Waubeka, town of Fredonia and graduated from Port Washington High School. He attended Marquette University in Milwaukee, majoring in engineering for two years before entering military service. Roger served our country in the United States Navy as a Second Class Petty Officer from 1967 to 1969 during the Vietnam War. Upon his return, he married and started a family, living many years on Chestnut Street in Port Washington. For more than twenty years each, Roger did sheet metal work for J&H Heating of Port Washington and FJA Christiansen Roofing and Sheet Metal of Milwaukee. This took him to many places throughout Wisconsin and surrounding states, including working on the Bradley Center in Milwaukee, amongst others. 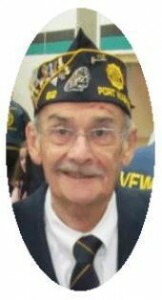 Roger was a proud 40+ year member and past commander of the Van Ells-Schanen American Legion Post 82 of Port Washington, Port Washington High School Veterans Honors Wall recipient in 2011, member in the 40 & 8 military association, Tin Can Sailor Association, National Flag Day Foundation of Waubeka and the Knights of Columbus. He enjoyed fishing, bowling, planting flowers, watching sports and playing cribbage with the boys at the Legion. His favorite, however, was being grandpa. He is survived by his children Katherine (Jeff) Lathrop of Port Washington and Joseph Wach of Madison, step-daughter Jackie (Rick) Vanden Heuvel of Appleton, grandchildren Jarrett, Jakob, Jayden, Kolton and Karleigh, his mother Armina Wach of Waubeka, his brother Jerry (Darlene) Wach of Germantown, his sister Carol Wach of Eden Prairie, MN, sister-in-law Connie Wach of Fredonia, nieces, nephews, other relatives and friends. Roger is preceded in death by his children Stephanie, Sarah and Edward Wach, his father Al Wach and his brother James Wach. Roger’s Mass of Christian Burial will be celebrated at 6:30PM Wednesday, October 9, 2013 at Divine Savior Parish-Holy Cross Chapel, 5330 County Road B., Holy Cross, town of Belgium, WI. Reverend James Ernster will be the celebrant. Final interment will take place at St. Mary’s Cemetery in Port Washington with military honors. Family will receive friends from 4-6:15PM Wednesday AT CHURCH. Memorials to the Van Ells-Schanen American Legion Post 82, 435 N Lake St., Port Washington, WI 53074 appreciated.